Announcement ColorVibe Designs presents one-of-a-kind hand-marbled silk scarves & silk tallits created by textile artist Sharon Gellerman in a fresh and modern interpretation of the classical art of marbling on fabric. The intricate designs and skillful use of color make each scarf tallit a unique and wearable piece of art. ColorVibe Designs presents one-of-a-kind hand-marbled silk scarves & silk tallits created by textile artist Sharon Gellerman in a fresh and modern interpretation of the classical art of marbling on fabric. The intricate designs and skillful use of color make each scarf tallit a unique and wearable piece of art. The fabric is then gently removed from the dye bath, gently rinsed and dried and the design is set in heat. When I’m pleased with the design that is formed on top of the cellulose solution. The fabric is than removed from the dye bath, gently rinsed and dried, and the design id set with heat. In a serendipitous moment of finding a scarf that captured my heart, I was inspired to learn more about this classical art form of marbling on silk, through many hours of exploring the technique and experimenting with dyes and colors, I developed my own signature style and design. I’m a fabric artist creating hand-marbled designs on silk and other natural fibers using a marbling process that originated in China many centuries ago. I am also an entrepreneur and the originator of ColorVibe Designs™. In 2003 I was first introduced to the intricate patterns and vibrant colors of hand-marbled designs on silk and was inspired to learn more about the history of this magical craft and to become proficient in it through self-study, practical application and perseverance. Working in my home studio and using fabric as my canvas, I've been able to express my design perspective and create unique custom textiles. My signature creation is the silk scarf designed as a one-of-a-kind piece of wearable art. Some of my design motifs are conceived as framed art pieces and I've also created fabric inlays for custom surfboards. Because of my passion for this unique artistry, it's very exciting for me to introduce other people to the beauty and appeal of the marbling process and to see them equally inspired. I frequently give demonstrations of the art of marbling on silk. I also offer a unique party event for anyone interested in hosting a memorable occasion where invited guests can enjoy a hands-on marbling experience. 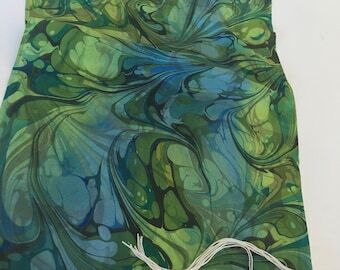 Using a marbling process, I create hand-marbled designs on silk. I pride myself in being self-taught. Using the blank piece of fabric as a canvas, I'm able to create a silk scarf / custom Tallit design as a one-of-a-kind piece of wearable art. ColorVibe Designs creates hand-marbled designs on silk and other natural fibers using a process that originated many centuries ago. We use this artistic process to create unique one of a kind silk scarves in various sizes.